I wanted to do an update of how I have tweaked Quarterly Pages and Monthly Pages. When I finish with this journal, I’ll be migrating over to a lined journal notebook (I think? 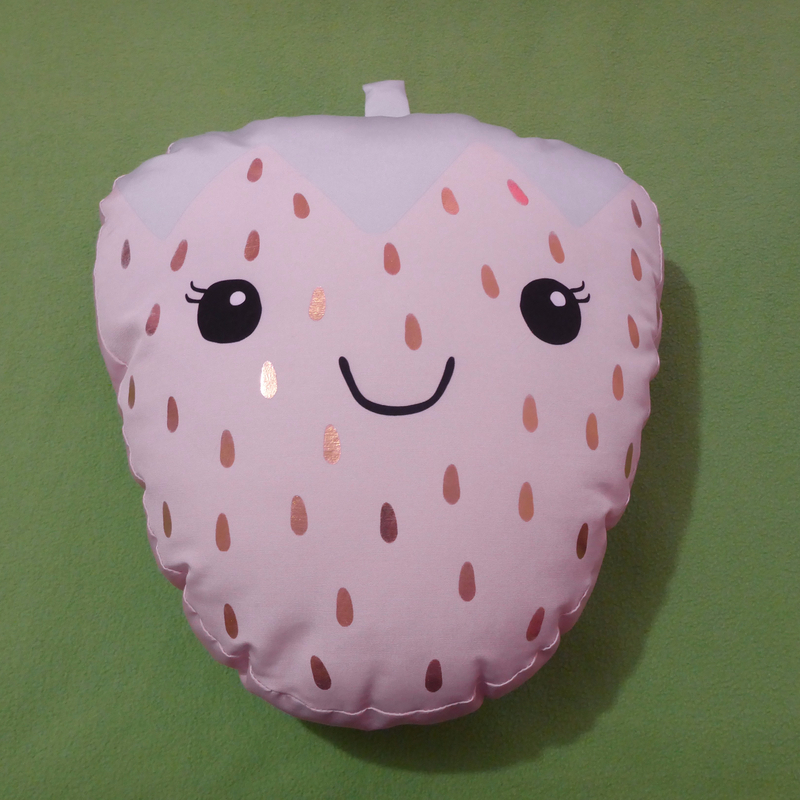 ), which means I’ll probably need to change my page layout style again to accommodate this. An example of this would be the monthly habit tracker, in my new journal I’ll most likely be printing out a template and sticking it in. To honest, I’m tempted to start doing this now, however, it would mess up the Aesthetics of my current Bullet Journal. My new journal may be more scrapbook-like than my current one, however, as I have a history of failure with scrapbooking, I don’t have high hopes for this. 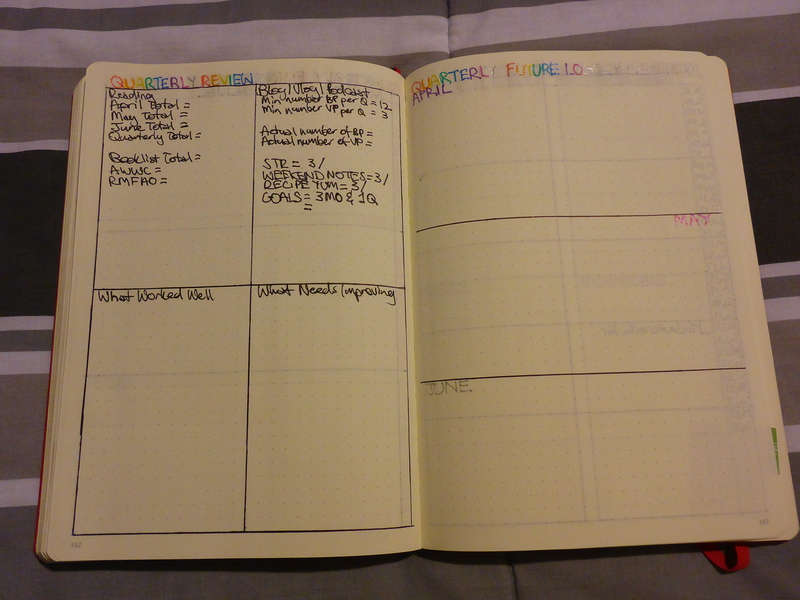 In my new journal, I am also considering using more stickers, tabs, and sticky notes. I purchased some cute calendar stickers from Wish and I like how they make my Monthly Focus pages easier to find. I have a slight hoarding problem with Stationery items and there’s not much point in hoarding if I don’t end up using it. Image Description: At the top of the page, in the rainbow text, is “Quarterly Goals: April – June 2019”. 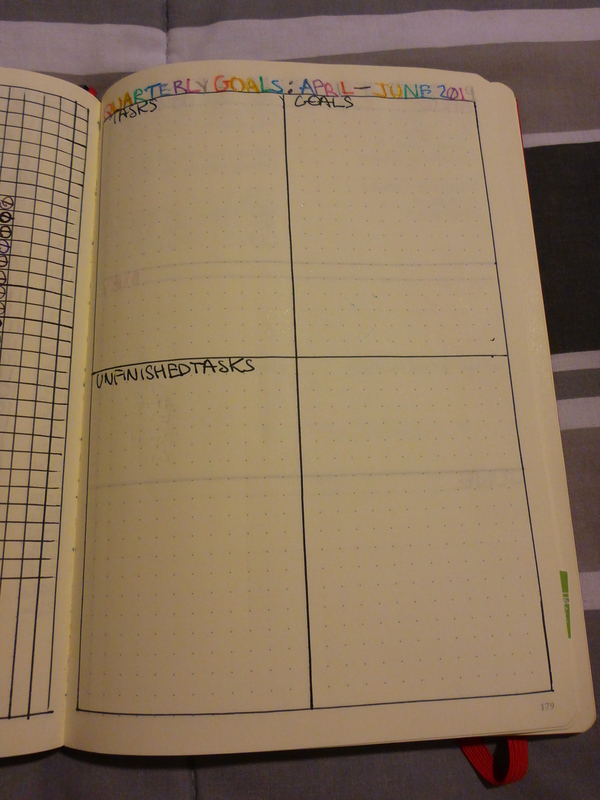 The page is divided into quarters and the quarters have titles like “Tasks”, “Goals”, and “Unfinished Tasks”. One Quarter is left blank. I much prefer this method of dividing the tasks by topic and thus being able to group more similar monthly tasks together. I’m not yet sure what to put in box number 4. Possible research topics? An inspiration square? IDK. Image Description: From left to right, the left page has been divided into three horizontal sections. Up the top of the first page is “Quarterly Blog/Vlog Posts” in a rainbow text. Underneath that is a heading of “April” in purple text, in middle section “May” in pink text, then in the last section “June” in silver. 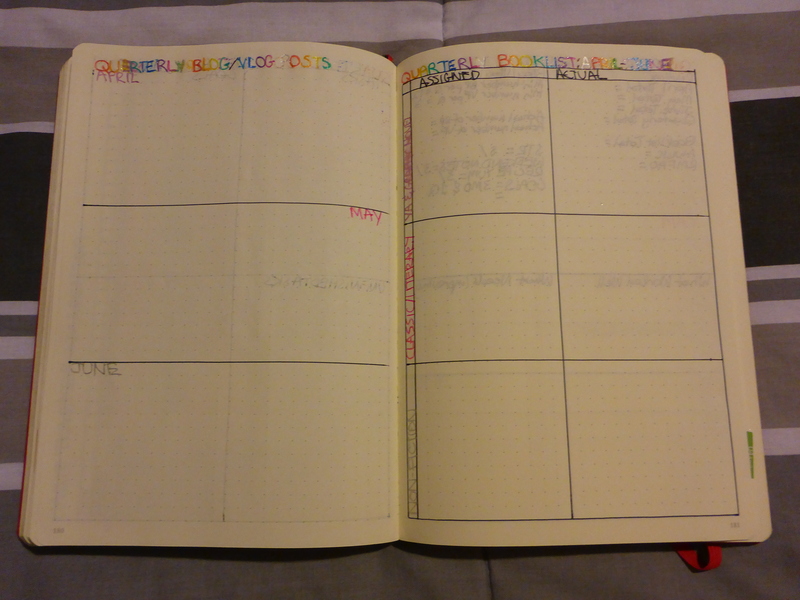 The right page has “Quarterly Booklist” in rainbow colours. Underneath that is two vertical columns that have been divided into three horizontal sections. So, the page looks like six squares with a small section for month genre titles. YA/Graphic Novels for April, Classic/Literary for May, and Non-Fiction for June. As I’m only making three videos per quarter (best case scenario), it seemed a little wasteful to dedicate an entire page to YouTube videos, so I decided to combine the quarterly blog and vlog page together. I felt the same way about my quarterly booklist page and so I decided the genre approach might be better. Out of all the Quarterly pages, I feel these are the most useful and productive, although the Review boxes need occasional tweaking. Image Description: image – The image is of two pages in my Bullet Journal. 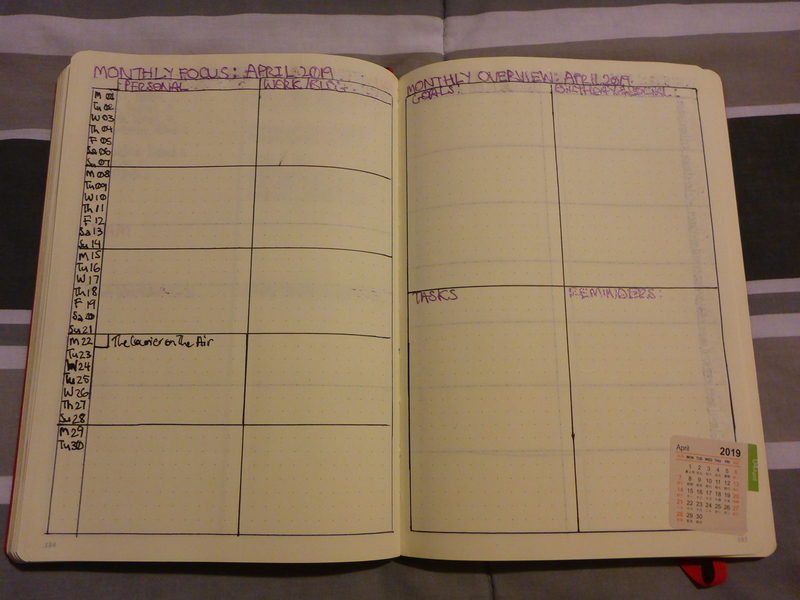 On the left, page one has “Monthly Focus: April 2019” in purple ink up the top of the page. Underneath that is two columns labelled “Personal” and “Work/Blogging” up the top. On the side is a thin vertical column that has the date and day of the week. The columns are divided into weeks. On the right, page two has “Monthly Focus: April 2019” in purple ink up the top of the page. Underneath that the page is divided into quarters. Each quarter has a title: “Goals”, “Birthdays & Social Events”, “Tasks”, and “Reminders”. 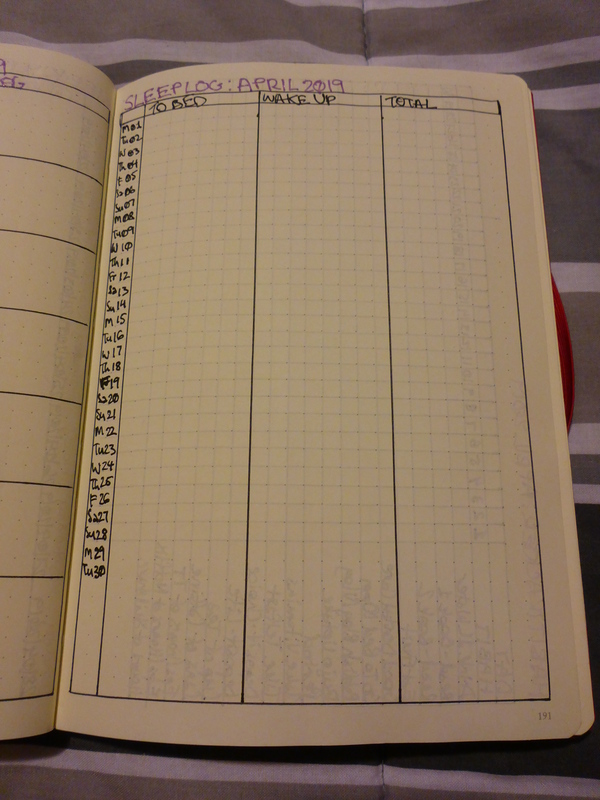 Image Description: image – The page has “Weekly Log: April 2019” in purple ink up the top of the page. 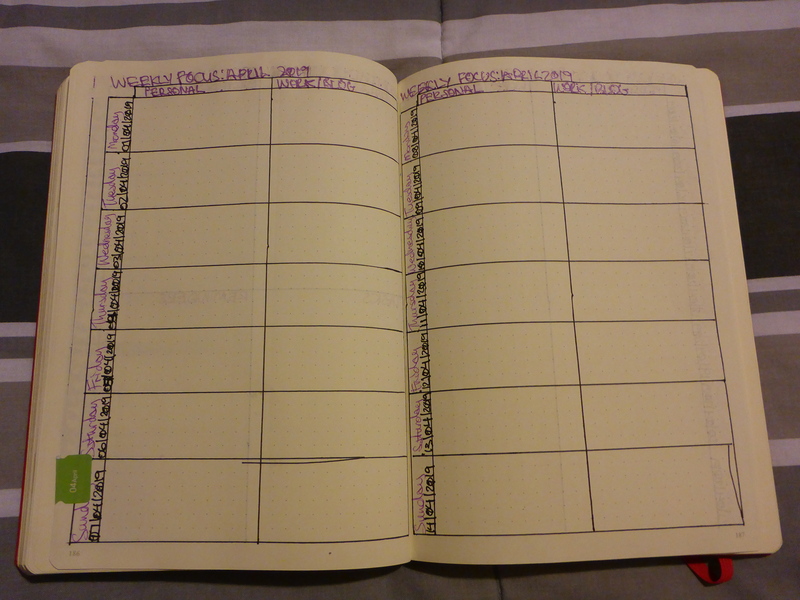 The page is divided into two columns: “Personal” and “Work/Blogging”. There’s a thin vertical column that details date in black ink and day of the week in purple. The columns are divided into seven sections to represent days of the week. The Monthly Focus and Weekly Log Pages have been working fine just the way they are, so there hasn’t been any changes to these pages since my last post, with the exception of a different colour theme change per month. 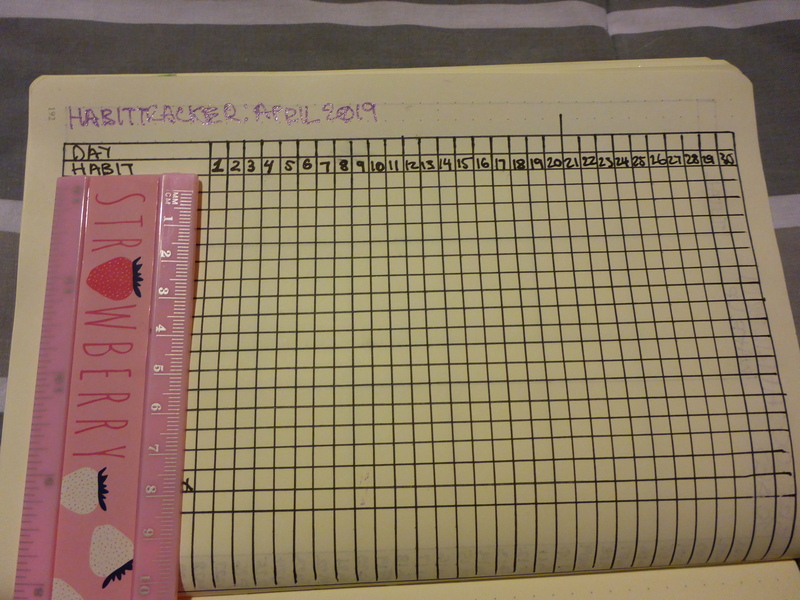 Image Description: Up the top of the page, in purple text, “Sleep Log: April 2019”. underneath are four columns: from left to right, a thin one with days of the week and dates going down in a vertical presentation. Then a vertical column that has “To Bed” at the top, then a vertical column that has “Wake Up” at the top, and then a vertical column that has “Total” at the top. I have updated my Sleep log. Previously it was a highlighted vertical graph, however, it lacked accuracy. This way I can be more precise with the time. My Habit Tracker hasn’t changed and is exactly the same. 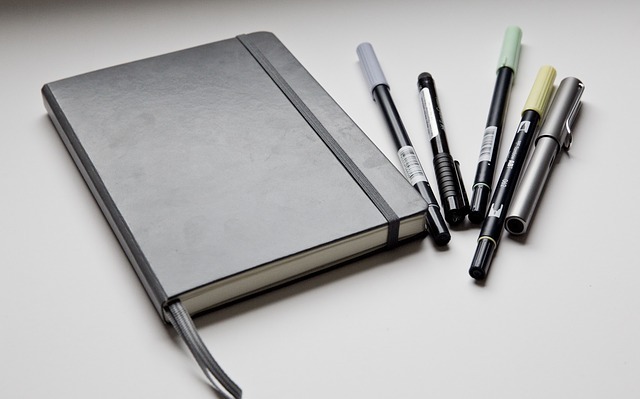 So, those are my pages, if you want to talk about your own Bullet Journal pages or Bullet Journal style, let me know in the comments section down below.